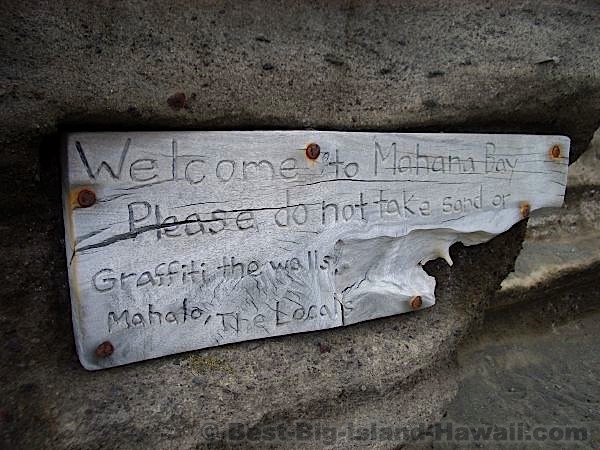 Welcome to The Big Island Beach Guide! This is a general guide to enjoying the beaches of Hawaii's Big Island. 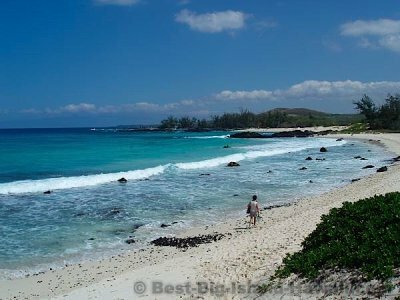 If you're looking for a listing of specific Big Island beaches, please visit the Big Island Beaches Main Page where you'll find links to pages filled with pictures, directions and other useful information on specific Big Island beaches. The purpose of this Big Island Beach Guide is to provide you with tips and advice for enjoying the beaches of the Big Island. For the seasoned beach-goer, some of this may seem like common sense. For others who are less ocean-savy and aren't used to the hot pacific sun, maybe you'll learn something new. This information comes from my experiences on the Big Island where I've spent many beautiful days at the beach with family and friends. Nothing is better than spending the day at the beach and the Big Island has some of the most beautiful beaches in there world. But before heading to the beach, it's important to know how to enjoy the ocean safely and in such a way that leaves the spots you visit just as beautiful and perfect for the next visitor. I hope you'll find the information in this Big Island Beach Guide useful in getting to know a little more about the Big Island and some of it's most beautiful spots. You may have heard the saying, "Don't turn your back on the ocean." I used to think this implied some kind of vague notion of respect. But respecting the ocean is very serious and for your own safety. The ocean can be beautiful and tranquil, but it is also powerful and potentially dangerous if you're not able to discern ocean conditions. Drownings are more likely in Hawaii than anywhere else in the United States. But when you're aware of and prepared for ocean conditions, Hawaii's beaches can be safe for everyone. It would be impossible to give a comprehensive list of what to look out for at every beach on the Big Island, but there are a few principles that will help to keep you safe in and around the ocean. The most obvious danger the ocean presents when it comes to enjoying the Big Island's beaches is the surf. The power of the waves in Hawaii can be overwhelming, even for experienced swimmers. A beach can be calm one day and pounded by huge waves the next. Turning your back on the ocean, even for a minute, can be dangerous as waves are often unpredictable. You might be swimming in small waves all day and suddenly, as if out of nowhere, larger waves can come crashing in. Swimming in surf conditions is much more strenuous than swimming in any lake or pool. Never swim alone, even if you're a strong swimmer. Children should never be left unattended at the beach, even at beaches that are patrolled by lifeguards. In a second, a wave can pull a child from ankle deep water in over their head. Most of the beach areas described on this site are reasonably predictable in terms of what to expect from the ocean, though surf conditions vary significantly from season to season, week to week and even day to day. I recommend enjoying the ocean in these well-trafficked areas. Stay out of the water in any unfamiliar spots. Lifeguards and locals are happy to help you understand the behavior of the ocean in various spots. But the best rule of thumb remains: When in doubt, don't go out." It is always better to be safe than sorry when it comes to ocean safety. A beach can look calm and safe from the shore to the inexperienced eye but strong currents, rogue waves and dangerous ocean floor conditions are often hard to detect. The ocean is full of life and this is very obvious in Hawaii. 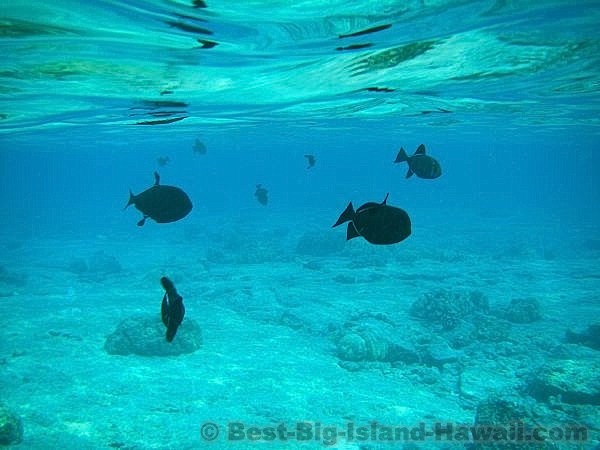 While at the beach on the Big Island you may see whales, dolphins, all kinds of fish and other sea creatures. Some people are so afraid of ocean life that they can't enjoy being in the water. For all the time I've spent in the Hawaiian water and all the wildlife I've seen, I've never been bothered by any sea life. Whales and dolphins stick to deeper waters and can be seen from a distance. There are sharks in Hawaii, but they are rare (I've never seen one). Fish and sea turtles can come closer but tend to stay out of your way. Sometimes, sea turtles may seem close enough to touch. It is very important that you never touch or bother sea turtles. It is actually against the law to disturb them in any way and this can carry a severe fine. Enjoy turtles calmly and from a reasonable distance. The most common problem that people have with sea life in Hawaii is the occasional sting from a sea urchin (or vauna). These little spiney creatures will stick you if you touch them. Their stings can be painful, but are rarely serious. Wanna know what the cure is? Urine.That's right, if you step on a sea urchin, pee on it (or have someone do it for you depending on where you get stung). Vinegar also works, but not as well I'm told. 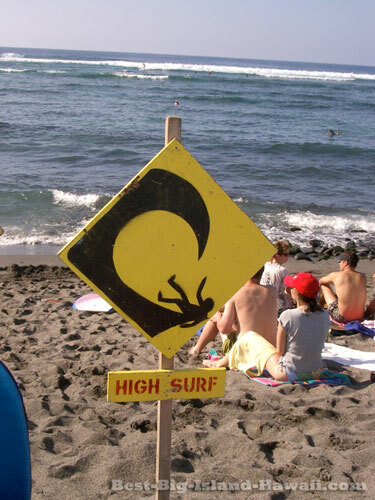 These cautions are not meant to scare you away from the beach in Hawaii. With a little common sense and attentiveness, it's certainly possible to enjoy the ocean safely. Just remember that the ocean deserves respect and all your beach days are likely to be pleasant and worry free. This one should be self-evident. The sun in Hawaii is hot and intense. There's nothing like a sunburn to ruin a holiday. This advice should be obvious... Always wear sunscreen! Also, limit your time in direct sunlight (especially in the afternoon hours when it's the most intense). Enjoy the sun but don't get burned. In Hawaiian there's a saying: Malama i ke Kai, which means Take Care of the Ocean. With the privilege of enjoying some of the best beaches in the world comes the responsibility of taking care of them so that they continue to be beautiful and enjoyable for everyone. Another saying that I've heard that pretty much sums of the etiquette of enjoying nature without damaging it is, "Leave only footprints and take only photographs." It's that easy. What ever you bring to the beach, take it back with you. And whatever is at the beach when you get there, leave it there. Taking what you bring should be obvious. No one wants a beach full of garbage, so just be courteous and pack out all your garbage including charcoals and any food waste. Not taking the beach with you may require some more explanation. It may seem like black sand, green sand and other beach features would be in endless supply. Well, that's just not the case. If everyone who visited the Big Island's beaches took some home with them, it wouldn't be too long before it was all gone. The sand, lava rock and coral found all over Hawaii are part of the Island and should stay part of the island, not become part of your aquarium. Again, it may seem like the island has lava rock to spare and helping yourself to some won't hurt anyone. But that's not how Madam Pele feels about it. Pele, the Hawaiian volcano goddess is said to curse anyone who takes a part of the island with them. Don't believe in curses? Ask the local post offices how many packages they get from all over the world filled with lava rocks sent back by people who took them and then had a run of bad luck. Aside from curses though, please respect the Hawaiian Islands by leaving them intact for everyone to enjoy. The etiquette presented in the Big Island Beach Guide for enjoying Hawaii's beaches and other natural wonders is mostly common sense. Respect the land, the ocean and the people who call Hawaii home and you'll always be welcome. All the gear you need to enjoy the beach is available on the island. Bring with you your favorite beach stuff from home, but also know that you can get pretty much anything you need after you arrive. A quick trip to Wal Mart or another local store and you'll be all set. Beach chairs, clothes, towels, toys, lifejackets, coolers, barbecues. What ever you need you can get it on the island. So don't worry too much about bringing it all with you. I recommend making a trip to the beach a whole day event. I've often had plans to go to the beach and do three other things in the same day. It rarely works out that way. Plan on taking your time and enjoying the beach rather than being on a tight schedule and rushing from place to place. There's just too much to do and likely not enough time. So make the most out of your time in Hawaii by not trying to do or see it all. The best days I've had at the beach on the Big Island have been laid back and carefree. If you ask me, that's the best way to enjoy the beach. Try new spots, but also keep going back to your favorites. It's not about seeing how much ground you can cover. Rather try to get the most of what you're doing. So whatever beach you're going to, sit back, relax and enjoy the beauty of the ocean and the Big Island. I hope this Big Island Beach Guide has been helpful and I hope the tips and advice here might help you to enjoy and get the most out of your time at the beach. When it comes down to it, the best Big Island Beach Guide is just your own common sense and preparedness. The ocean is a beautiful thing and there's no better place to enjoy it than on the Big Island!